It’s just a day before I leave for Sock Summit and I’m proud to say we will have more pottery than we have ever had for a show – ever! Besides the pottery there are gads buttons, stitch markers, jewelry and spiffy new t-shirts too! Full tilt production and many kilns have been fired during the nastiest heat wave of the season. Firing kilns in the winter is great, the summer not so much. If your planning on attending I’m in a corner booth #723. Here’s a link to the marketplace map pdf. Take a look and plan your shopping. It’s easier than being overwhlmed by the amazing booty that will be there! I have made many special Sock summit 2011 mugs and will be saving a small quantity in reserve for folks attending the market on Friday, Saturday and Sunday. If your heart is set on one, please come early and choose your mug. If they sell out again I might be persuaded to do a special order for later delivery. In addition to the pots in the booth I have also made a few pieces for the silent auction on Thursday evening 6:00 – 8:30. The money raised goes to Doctor’s Without Borders / MSF. 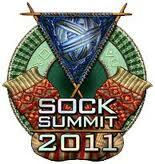 One mugs, one large yarn bowl and one jar in this year’s Sock Summit 2011 Mt. Hood design will be there. Please come early and bid often. It’s for a great cause. I say this a lot, but it bears repeating. I hand make each and every item. Each piece has it’s own character and thus they are all a little different. While they all begin as the same weight ball of clay some are taller, squatter, or curvier. Like people they have personality. It’s part of what makes handmade items so special. So, come stop by say hi. Introduce yourself. Fondle the pottery, it’s meant to be held. Make a connection with a pot or a person – or both. This is the fun part of what I get to do. I look forward to meeting you. This entry was posted in Uncategorized and tagged events, jenniethepotter, knitting, socksummit on July 26, 2011 by Jennie. Congratulations, we always knew that you were “in vogue”, but now you are really in”Vogue”. Received my copy in the mail today and it’s one of the first things I noticed. Love your blogging. Since I live in one of the red clay capitals of the U.S. When my kids were little they would fashion stuff out of the creek with North Carolina red clay.